As you can see in the chart below, the majority of the 350 business and technology executives we surveyed list security as the top concern influencing their cloud migration strategies. To what extent do concerns about the following influence your migration strategies? Rate on a scale of 1–5, where 1 = Not at all and 5 = To a great extent. (Top 2-box scores) Click to enlarge The industries we surveyed—healthcare, government/education, retail, professional services, and financial services—each listed data security as a top concern. But there were meaningful variations by industry. Respondents from the healthcare industry are far more concerned about data security—87%—likely due to the large amount of sensitive data handled on a day-to-day basis. Meanwhile, the government/education industry is much less concerned about cost than the total group (38% vs. 49% of the total). Retail, on the other hand, named cost as their second biggest concern after data security—61%. Professional services firms are significantly more concerned than the total when it comes to platform compatibility. That concern comes second with 61%, vs. 52% of the total. Financial services, another industry with large amounts of sensitive data, placed outsized concern on privacy—63%. While security consistently ranks as a top concern and barrier to cloud adoption, industries have a variety of specific concerns to address on their path to value. This week we’ll be bringing you an in-depth look at some findings from our Path to Value survey of 350 business and technology executives. From previous posts, we’ve seen that companies are moving assets to the cloud, but planning is in short supply. 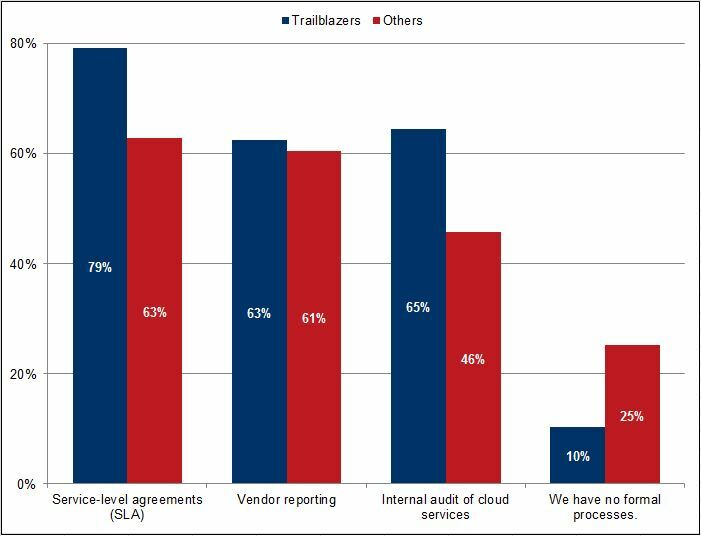 We’ve also seen what our Trailblazers—those respondents furthest in their cloud migration—are doing to stay ahead. But in what ways is cloud strategy critical to companies? As you can see, cloud is growing in strategic importance across all areas. But each industry we surveyed sees the most growth in different areas. 55% of respondents from the healthcare industry expect cloud to enable them to move to new geographical markets in two years—a growth of 72% from today. 54% of government/education respondents say cloud will support business-model transformation at their firms in two years, another 70% increase. Retailers tend to be laggards in our survey—yet nearly half say that cloud will be critical to their innovation strategy in two years, a growth of 77%. Finally, the majority of both financial and professional services respondents expect cloud to push control of IT to line-of-business users in two years—growing 78% for professional services respondents and 60% for financial services. This week was a big week for the Path the Value in the Cloud. We released a briefing paper outlining the findings of our survey of 350 business and technology executives nationwide. We found that cloud technology is fundamentally altering business processes and changing the ways firms interact with customers, partners, and employees. But many companies lack a migration plan and metrics for measuring their success in the cloud. The full paper can be downloaded here. We also released an interactive infographic detailing some top-level findings of the survey in an easily shareable format. You can view the infographic here. But we’re not done yet. In the coming weeks, we’ll be releasing four think pieces—short papers that delve deeply into some of the issues raised in our briefing paper, including cloud migration strategy, security in the cloud, how cloud is driving business value, and our cloud Trailblazers. We’ll also release infographics alongside these think pieces to provide a snapshot into these major issues. And, as always, we’ll continue to update here along the way with key findings, cloud news, and project information. This interactive infographic reveals some top-level findings from our survey of 350 business and technology executives across the US. Click through to see what companies expect to gain from their cloud migrations, what functions they’re moving to the cloud, and how they are moving on their path to value. Our Path to Value survey of 350 business and technology executives across the United States revealed some surprising insights into how businesses approach and migrate to the cloud. Strong majorities of companies think cloud will be a driver of innovation and expansion in two years, and companies are seeing measurable results from their cloud migrations. Additionally, we found a strong correlation between increased revenues and a more sophisticated adoption of cloud. In addition to leading along the path to value in the cloud, our Trailblazers have a more sophisticated understanding of cloud services providers. We’ve already seen how Trailblazers overwhelmingly use SLAs and internal audits to manage the quality and integrity of their cloud services. But how do they choose a cloud provider in the first place? How important are the following qualities in a cloud services provider? 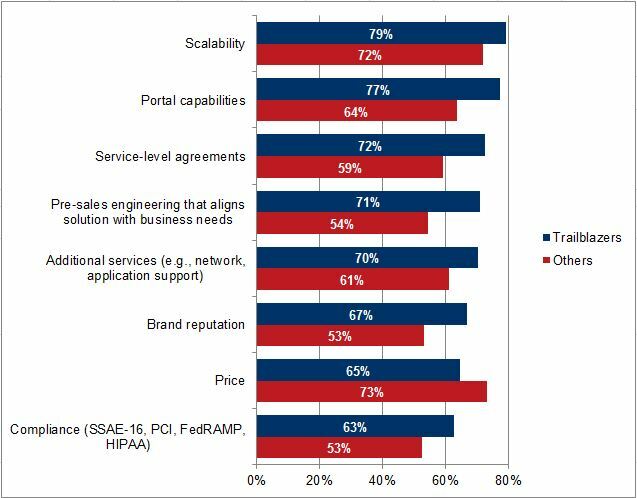 (Top 2 box scores) Click to enlarge Whereas the rest of our respondents are much more concerned about price, Trailblazers’ priorities reflect their cloud sophistication. By valuing factors like scalability, SLAs, and pre-sales engineering, Trailblazers are more likely to get the most value from a cloud provider, and make their cloud migration successful. Next we will look at what Trailblazers see as distinguishing factors between cloud services providers.